It has been the brilliance of Slovenian philosopher Slavoj Zizek (b. 1949) to weave together theology, psychoanalysis, and politics in a unique fashion to provide stunning commentary on contemporary culture. Assuming little prior knowledge of this controversial (atheist, communist) philosopher, Marcus Pound provides the first comprehensive, systematic account of Zizek's work as it relates specifically to theology and religious studies. 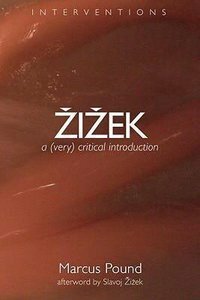 ^^First exploring Zizek's background in Jacques Lacan and German philosophy, Pound goes on to critically engage his concept of God, the mechanics of belief, his metaphysics of faith, the role of religious ideology in his thought, and why a political act must necessarily assume the form of a religious act. Finally Pound considers the impact of Zizek's work on current theological thought concerning gift and sacrifice, gender and sexuality, and the politics of interreligious debate. Dr Marcus Pound is research fellow in Catholic studies at Durham University, UK, and assistant director of the Durham Centre for Catholic Studies. He is the author of Theology, Psychoanalysis and Trauma and Zizek: A (Very) Critical Introduction.